St. Louis-based Starrco, a leading supplier of modular offices, has partnered with family-owned Storage & Distribution Systems, a business that carries more than 700 lines of material handling products. 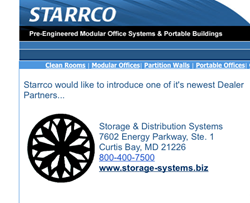 St. Louis-St. Louis-based Starrco has partnered with Storage & Distribution Systems (SDS). Starrco products will now be sold through SDS. SDS is located in Curtis Bay, Md., and carries more than 700 lines of material handling products. The family-owned business specializes in shelving, modular offices, wire partitions, lab storage, tenant lockers and more. SDS can provide quotes, layouts and installation for all of their products. The company services Maryland, D.C., Virginia, Delaware and Pennsylvania areas with local sales people working side-by-side with the end user to give them storage solutions that fit their needs. Partnering with distributors has many benefits to the end user. These benefits include, installation, local support on the job-site, and the knowledge the distributor representative has on Starrco products. For more information on Storage & Distribution Systems, please visit the website at http://www.storage-systems.biz or call 800-400-7500. Starrco offers a wide variety of modular office systems - from single user offices to two-story multiple modular office complexes. Modular office systems are manufactured to precisely fit the client's application and are installed in a fraction of the time of conventional construction. Portable office materials come completely finished and require no sanding or painting. Starrco offers a wide variety of materials, finishes and colors that allow customers the freedom to design systems that meet specific needs and personal style. In addition to pre-engineered modular office systems, Starrco manufactures modular clean room systems, floor to ceiling modular office wall partitions, Starrguard Safety Guard Rail and pre-assembled portable offices and buildings. With a network of factory-trained distributors, supported by Starrco St. Louis, Missouri staff, projects are completed on time and on budget. Contact Starrco today at 800-325-4259 or request information here.